A simple way to enjoy the many benefits of lemons is to include the juice of this amazing citrus fruit in many of the beverages and meals you enjoy. What a great way to improve your diet or enhance an already healthy one. Potassium, vitamin C, most of the vitamin B complex, citric acid, calcium, iron, magnesium, phosphorous, zinc, and so much more. Since there are so many benefits we will try to pick out the more significant ones, even though they are all important. Rich in Vitamin C which contain antioxidants that help reduce the everyday cell damage our bodies encounter from the environment we live in. They also help strengthen the immune system and help the body absorb iron which is needed in the production of red blood cells and helps maintain proper levels of oxygen intake. Things that can produce cell damage surround us daily such as air pollutants, chemicals, alcohol, tobacco and many others. Antioxidants help reduce cell damage which will slow down the aging process, will help keep your skin healthy looking, helps maintain good health and assist in disease prevention such as cancer. Quite simply, things that we consume that contain antioxidants help detoxify the body. Another great way to detox the body is by doing a lemon cleanse. They are so easy to do. One of the best cleanses out there right now is the Master Cleanse Secrets eBook which offers an easy to follow detox plan that actually works. Of course vitamin C also helps with the production of collagen and elastin which helps keep us looking young. It also helps keep our bones and connective tissue healthy and helps prevent cataracts of the eye. Anything that helps detox the body and improve liver function helps with weight loss. That is how it works. As the body becomes cleaner and healthier it functions to eliminate the fat rather than store it. This is why lemon water is such a great weight loss drink. Not only does it help cleanse our bodies but water alone helps fill up our tummies so we eat less. Such a simple weight loss trick but so very effective. Magnesium is such a vital mineral needed by the human body. It plays a strong role in muscle function including the heart muscle. It is also needed in energy production and bone maintenance. When we are deficient in magnesium we may encounter depression, mood swings, irritability, dizziness, muscle weakness, possible onset of osteoporosis and a whole slew of other problems. Iron is extremely important as its main function is to help carry oxygen to all parts of the body. It is required for a healthy immune system and energy production. There are several B complex vitamins and they provide many health benefits. To name a few they help maintain healthy muscle and heart functions. They assist the digestive system; help with development and growth, production of hormones and immune system strength. But the one benefit I find very important is how these vitamins help with our nervous system. Anything that helps me feel calm is a good thing. For me being calm and having a strong nervous system helps me battle all the day to day stuff that we all have to encounter whether it is good or bad. The best way to enjoy lemons is by squeezing the juice out of them and adding it to beverages such as water, regular tea, herbal teas, homemade juices, punches, sodas, special detox drinks, homemade lemonade and any other drinks you think it would go good with. Of course freshly squeezed lemon is a favorite for many on Caesar salad and seafood. You can also add its juice in salad dressings and spreads or add it to freshly made salsa. 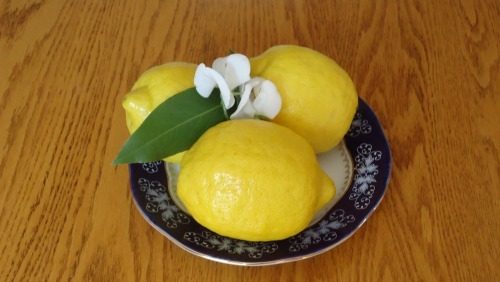 It can also be used in deserts, perhaps a naturally made lemon sorbet, just to give you a few ideas. Get creative and add this powerful fruit or its juices to all kinds of dishes, what a great way to reap the benefits of lemons. Lemons are very affordable especially when in season but the best part is that grocery stores carry this fruit all year round and even off season they are usually reasonable in price. Freshly squeezed lemon gives you the highest health benefits of lemon water, so it is worth the time and effort to juice them yourself and avoid buying the bottled stuff. One of the easiest ways to enjoy the benefits of lemons on a regular basis is by enjoying a glass of lemon water every morning. Tried everything to give your body a quick detox for weight loss and added health?